Facebook Tips and Tricks: Tricks to avoid "Facebook Cloning"
Tricks to avoid "Facebook Cloning"
Are there any "CopyCats" around you? Some people can create a fake profile of yours with some tricks. This may be hacking but this involves a process called "Cloning". When you have your personal account then how can anyone else take charge of your account by creating a fake one which is similar to yours!!! Here the trick of creating "Facebook Cloning" is used. In other terms, Facebook cloning is a type of stealing one's identity where dodgy characters make a second profile which is similar to the current one. Later on they send the friend requests to all your friends from the cloned profile. It is nothing but they are fooling your friends by sending fake requests from the cloned profile. The process then comes at a stage where they post comments or add images and chat with your friends with your identity. The cloned profile helps to do them all these stuff. In such cases, when any other person who is not known to you and cloning your profile to use your contacts for communicating, it is theft and something must be done to avoid it. 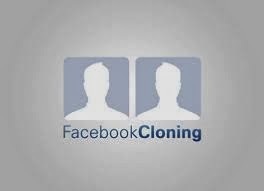 Before making any steps for avoiding Facebook cloning, you should first know whether it is really been done or not and how they do it. Now the time has come to block you to see the new fake or cloned profile by just clicking on "Report / Block" option. Once this is done you will never come to know that a new fake or cloned id is prepared without your knowledge. Now they will do as they want to do in the new cloned fake Facebook profile but "As You"
This post is to make you aware of the process of cloning in Facebook and not to fear you. Once all this is done, then they start sending friend requests, share their comments , like pages and groups , everything else but only difference will be you will not know that they are using your cloned profile for doing all this. In the article by Nivashni Nair, where the writer points out about few cases that have been victims about Facebook ID's Cloned. The main reason behind this is Privacy Settings and Accepting any Friend request. Cloners will start their steps with sending a friend request to you. Once you have accepted they have won half the battle. So, when accepting any request, first check whether the person who is sending the friend request is known or not known or has atleast 1 mutual friend in common. Most importantly , Facebook has its "Help Center" where you can go through for more information. Report to any fraud being done against you immediately. If the cloning of your Facebook profile is gone to an extent that you cannot deal then better to inform your friends and family that you are deleting your profile completely and creating a new one. And as soon as you take this decision, better delete your present account and create a new one with a fresh look.